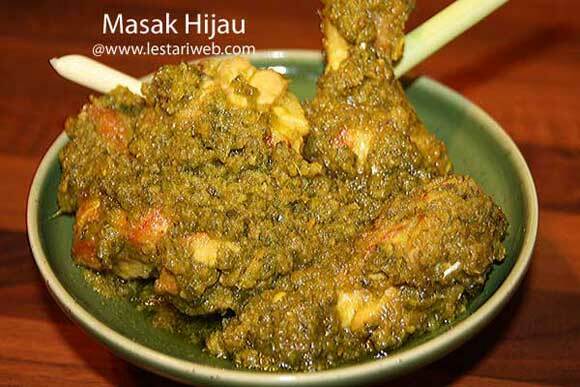 Masak Hijau (Cooking in Green Sauce) is a typical dish from Banjarmasin, South Kalimantan. Hijau means green! So the name already suggest it's character which's dominated by the green colour, provided by the large green chillies. As example this time I choose chicken as the main course to be cooked. Anyway before I forget, for you who do not like spicy food, you don't need to worry. Although this dish contain a lot of chillies, de-seeded large green chilli is not so spicy as bird's eye chilli. 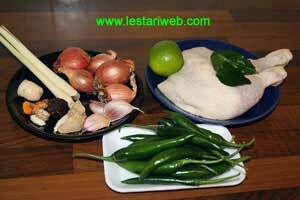 Put the chicken in a bowl and mix with salt and lime juice. Put aside for 15 minutes. Heat 50 ml oil in a frying pan, fry the chicken pieces until golden brown. Set aside to drain. Heat 2 tbsp oil in another frying pan (Don't add oil if already added in a blender) and stir fry the paste, lemongrass and kaffir-lime leaves . Stirring all the time until the paste well cooked & fragrant. Pour in the water, bring to boil and continue simmering until the water is driven off and the sauce has become thick. Stir occationally. Add the fried chicken and continue cooking until the sauce has becomes almost dry. At this stage you will probably need to stir all the time to prevent burning. Serve hot with rice.